Hi everyone, first post on this forum. Wife and i just bought a '19 Cooper Convertible, Pepper White. Wife does not like the intrusion in rear vision due to the rear head rests, so she pulled them off and now they sit in the trunk sliding around and getting in the way. 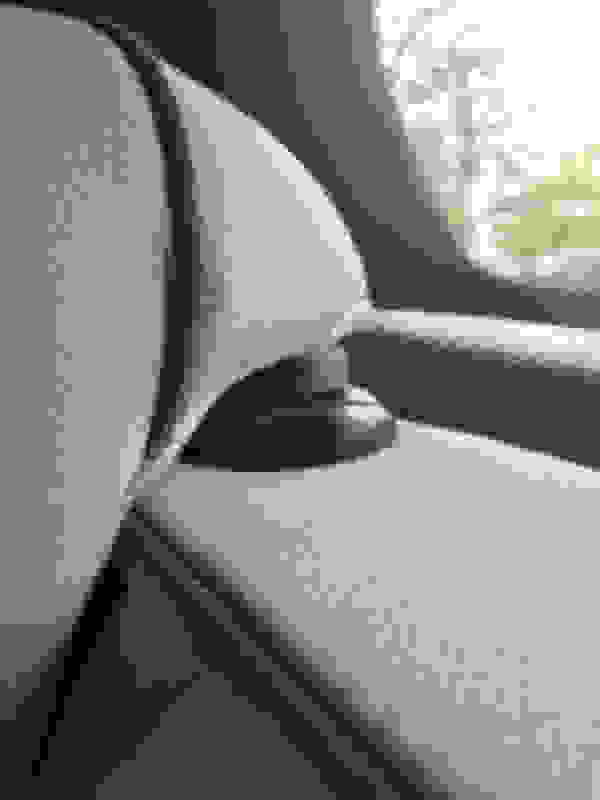 I noticed the shape of the headrest would allow it to sit very low (if moved to the lowest possible position) on the seat top and "wrap around" the top of the seat very well, except there is a black plastic gadget on one of the headrest posts that prevents the headrest from lowering very far. 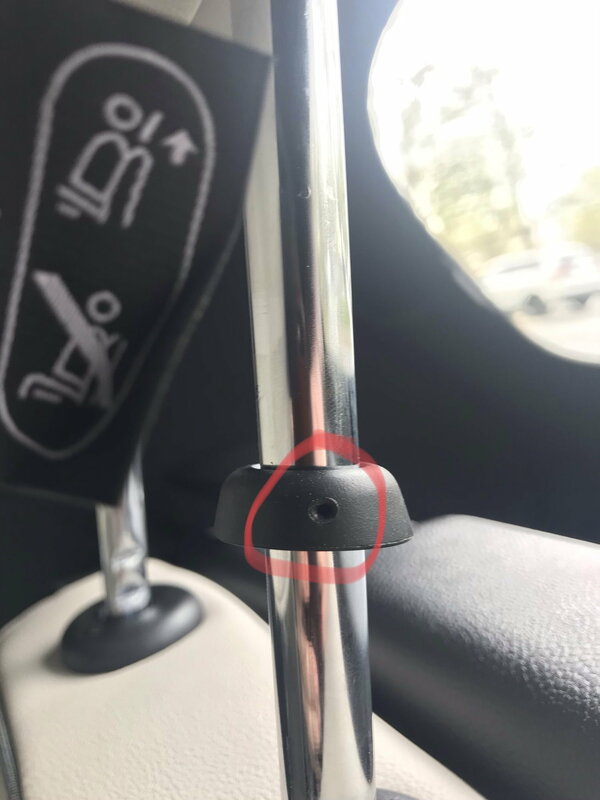 Short of tearing it off with a pair of pliers (seems locked on there), has anyone been able to remove the plastic gadget so that the headrest can be lowered to its lowest position? Seems crazy to have the headrests loose in the car, and they sure do stick up far. thanks. Dave. The black plastic needs to stay in place It lets you adjust the headrest up and down. However, there is a little metal pin on that side of the headrest that functions as a stop. Use a tiny little eyeglass sized screwdriver to push out the pin. Much better visibility with them all the way down. Last edited by Daki; 04-08-2019 at 11:02 AM. Typically headrest posts have notches in them that catch the spring loaded button that is on the seat to select height, and these ones are no different. The black plastic thingie appears to just be a stopper that prevents the headrest from going down further...seems to me it has nothing to do with setting the height other than limiting travel. Am i missing something? I popped my plastic things off years ago, but I still put the seats down if nobody is sitting back there...which is 99 percent of the time. I was misremembering the plastic bits. If you look at the black plastic ring, there should be a pin visible which it what prevents the headrest from going down. Just push the pin out. I still have the plastic ring, but without the little pin The headrest goes all the way down. I used a paper clip to push out the little metal pins in the plastic rings before we even left the dealer when taking delivery of our F57. Threw the pins and the plastic rings right in the garbage and immediately lowered the rear headrests all the way! I think legislators and insurance companies think U.S. car passengers are too dumb to adjust the rear headrests on our own, so they make it "impossible" to put them down, thereby ensuring rear passengers are protected from whiplash and such. It's dumb. European photos show the headrest all the way down. When I first started seriously looking at new cars, I was perplexed by the all dealership photos showing them raised up so high. I'm guessing the US has a minimum height requirement, and since our rear seats are kind of short, the silly pin passes that test? My husband and I discovered that limitation when we went on a test drive. I'm happy that the pin comes out so easily, and that my rear seats don't look like they are occupied by Star Wars droids .